The 2017-18 state budget passed by the Senate this morning and headed to the House demonstrates a bi-partisan compromise that prioritizes children. Following the governor’s lead set in his budget request, Democrats and Republicans came together and prioritized the state’s 2.8 million children by increasing state investments in child welfare, early learning and K-12 education. Continue Reading »"Kids win big in 2017-18 state budget"
Pennsylvania Partnerships for Children President and CEO Joan Benso said the 2017-18 state budget proposal Gov. 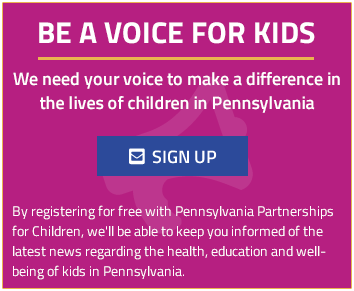 Tom Wolf unveiled today would improve the quality of life for Pennsylvania’s children across the four key policy areas of the organization’s work to make Pennsylvania one of the top 10 states to be a child and to raise a child. Continue Reading »"Governor’s 2017-18 Budget Proposal Invests in Kids"
Gov. Tom Wolf’s proposed budget for fiscal 2016-17 makes smart and strategic investments that Pennsylvania’s children need to succeed, Pennsylvania Partnerships for Children President and CEO Joan Benso said today. Continue Reading »"Governor’s Budget Makes Much-Needed Investments in Kids"